In the 1950s, before integrated circuits or even transistors, mainframe computers were built from thousands of power-hungry vacuum tubes filling massive cabinets. To simplify construction and maintenance of these computers, IBM invented a pluggable module with eight tubes;1 failed modules could be quickly pulled out of the computer and replaced. 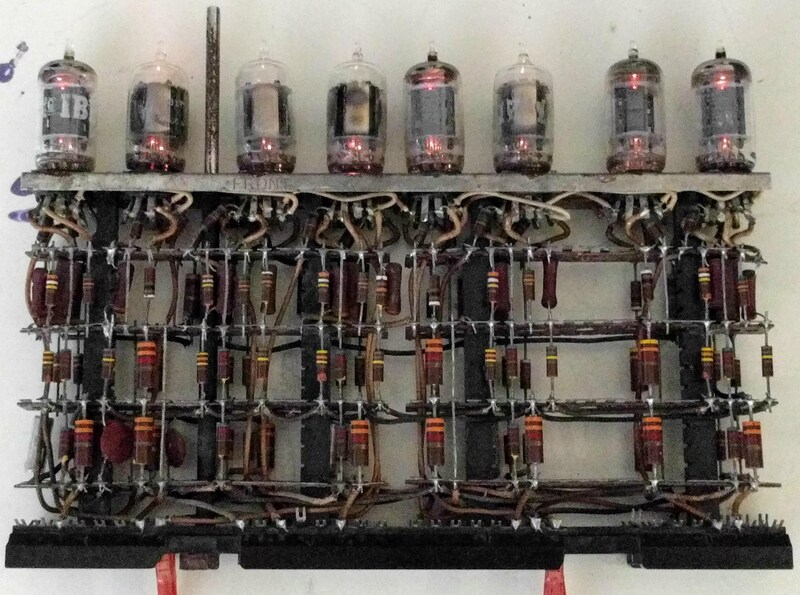 I came across one of these tube modules and wondered if it would still work decades later. Could I power it up and demonstrate it in a circuit, or would the components have failed with time? The glowing orange filaments are visible in the tubes of this IBM tube module. This 8-tube module is a key debouncer from the IBM 705 business computer. 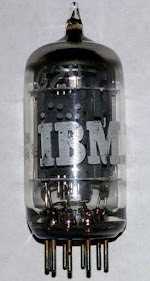 Part I of my post discussed tube modules and described the IBM 705 that used this module. 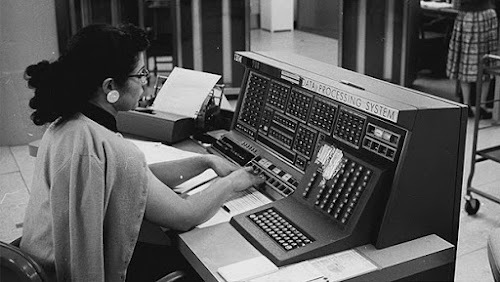 To recap, the IBM 705 was a large business computer introduced in 1954. It weighed 16 tons, used 70 kilowatts of power and cost $15 million (in 2018 dollars). A few dozen 705 systems were built, mostly used by large companies and the US government. For example, Texaco2 used the 705 for accounting applications such as payroll, marketing, and distribution. Even though the 705 was intended as a business computer, Texaco also used it for technical applications such as refinery simulation and pipe stress analysis. Below you can see the large CPU of an IBM 705 computer. Each of the four panels in the front held up to 80 tube modules. The CPU of an IBM 705. From IBM 705 Electronic Data Processing Machine brochure. 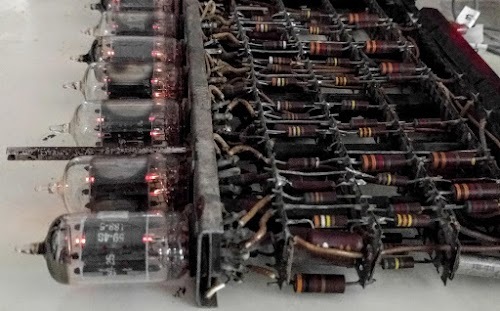 By tracing out the circuitry of the tube module and studying old IBM documents, I determined that the module consisted of five key debouncing circuits. When you press a key or button, the metal contacts inside the switch tend to bounce against each other a few times before closing, so you end up with multiple open/closed signals, rather than a nice, clean signal. To use a key signal in a computer, it needs to be "debounced", with the multiple rapid transitions replaced by a single, clean transition. (Perhaps you have used a cheap keyboard that occasionally gives you double letters; this happens when the keyboard bounces more than the debounce circuit can handle.) 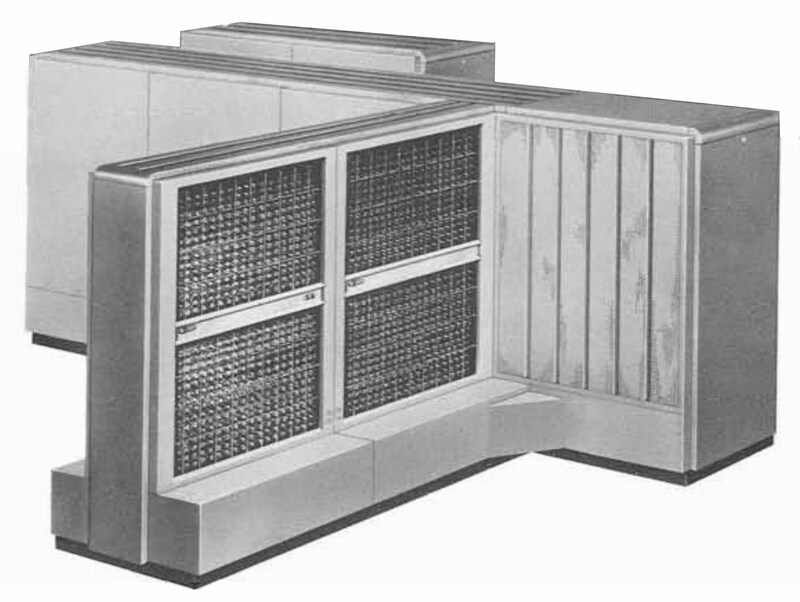 In modern systems, debouncing is usually done in software, but back in the 1950s tubes were used for debouncing. 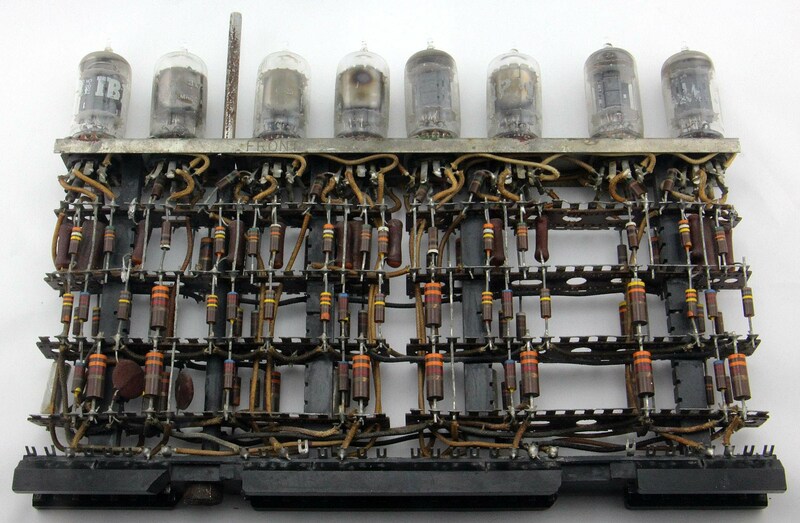 This tube module from an IBM 705 mainframe computer, implemented five key debouncing circuits. Console of an IBM 705 computer. That console was used to control the computer and for debugging it. Photo from IBM. 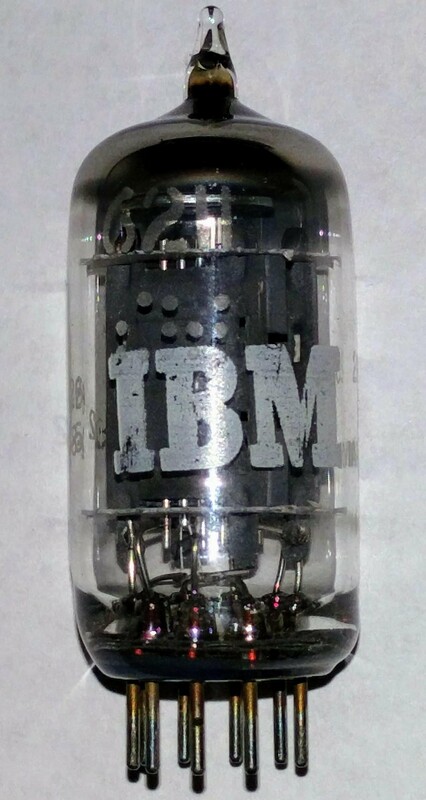 IBM 6211 vacuum tube: a dual triode. The pins plug into a socket on the top of the tube module. The plates are visible inside the tube. The number 6211 is faintly visible near the top of the tube. Since most readers probably haven't used vacuum tubes, I'll give a bit of background. This module was built from a common type of vacuum tube known as a triode. In a triode, electrons flow from the cathode to the plate (or anode), under the control of the grid. The heater, similar to a light bulb filament, heats the cathode to around 1000°F, causing electrons to "boil" off the cathode. The anode has a large positive voltage (+140V in this module), which attracts the negatively-charged electrons. The grid is placed between the cathode and the anode to control the electron flow. If the grid is negative, it repels the electrons, blocking the flow to the plate. Thus, the triode can act as a switch, with the grid turning on and off the flow of electrons. The module I examined used dual triode tubes, combining two triodes into one tube for compactness. Two vacuum tube circuits form the building blocks of this tube module: the inverting amplifier and the cathode follower. 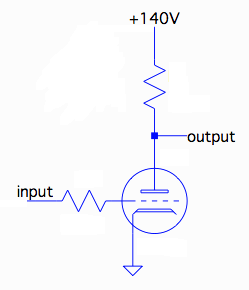 The schematic below shows a vacuum tube inverting amplifier (slightly simplified). If the input to the grid is negative, the flow of electrons through the tube is blocked, and the output is pulled up to +140 volts by the resistor. If the input to the grid is positive, electrons flow through the tube, pulling the plate output close to ground. Thus, the circuit both amplifies the input (since a small input change causes a large output change) and inverts the input. An inverting amplifier built from a vacuum tube triode. 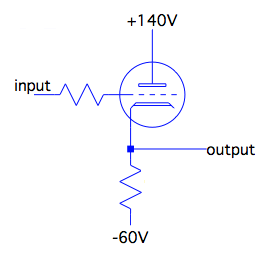 The second circuit used in the module is the cathode follower, which is essentially a buffer; its low-impedance output let it drive other circuits. While the schematic (below) looks similar to the inverter, it has the opposite effect since the output is from the cathode, not the plate. If a positive input voltage is fed into the grid, the tube will conduct. The voltage drop across the cathode resistor will cause the cathode voltage (and thus the output voltage) to rise. On the other hand, if the input voltage is negative, electron flow will be reduced, shrinking the voltage drop across the resistor and reducing the cathode voltage. Either way, the cathode voltage (and output) will adjust to be approximately equal to the input voltage. The trick is that it's not a negative grid per se that blocks electron flow, but a negative grid with respect to the cathode.4 Thus the cathode follower essentially copies its input voltage to the output, but providing higher current. 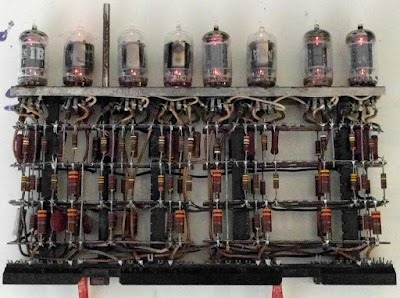 A cathode follower buffer built from a vacuum tube triode. The first step in making the module operational was to power up the vacuum tube filaments. Filaments usually operate at 6.3V AC for historical reasons (a 6V lead-acid battery contained three 2.1V cells, yielding 6.3V). Each tube's filament uses almost 3 watts, so a large filament transformer is necessary. The filament energy consumption is part of the reason tube-based computers used so much power. 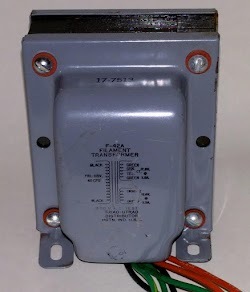 The filament transformer converts AC line input to 6.3V to power the filaments. The transformer weighs 3.5 pounds. We connected the transformer and inserted tubes one at a time to power up their filaments. Everything went smoothly—the tubes all lit up with a nice orange glow and none were burnt out. Each tube has two filaments (since they are dual triodes), so we could see two orange spots in each. The tubes give off an orange glow when the filaments are powered with 6.3V AC. To run the tube module, we used a stack of power supplies and test equipment. Two more power supplies are under the table. To keep the wiring under control, I built a junction box between the power supplies and the tube module. It also includes a pushbutton to control the input. 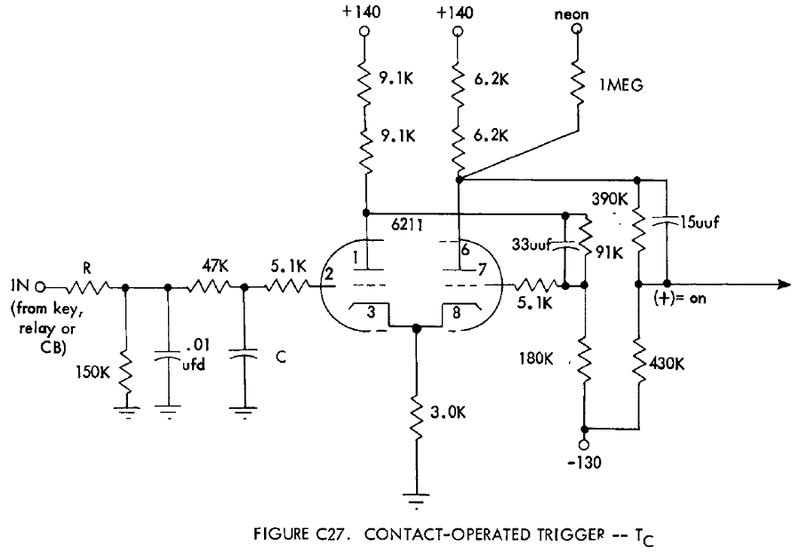 The schematic78 below shows one of the debounce circuits, which IBM called a "contact-operated trigger". 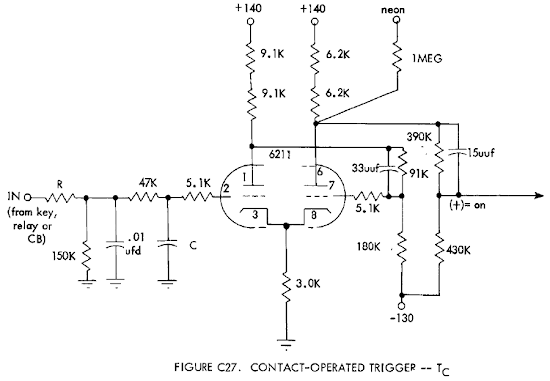 (A trigger is the old term for a flip-flop, or a similar circuit that can be in two states.) The input goes through the resistor-capacitor low-pass filter on the left, smoothing out the input so the circuit won't respond to bounces. This goes to the grid (2) of a triode inverter amplifier as discussed earlier. The output from the first inverter (plate, 1) is connected to a second inverter (grid, 7) via the 91K resistor. The output from the second inverter (plate, 6) is shifted to the desired +30/-10 voltage range by a voltage divider (the 390K and 430K resistors). 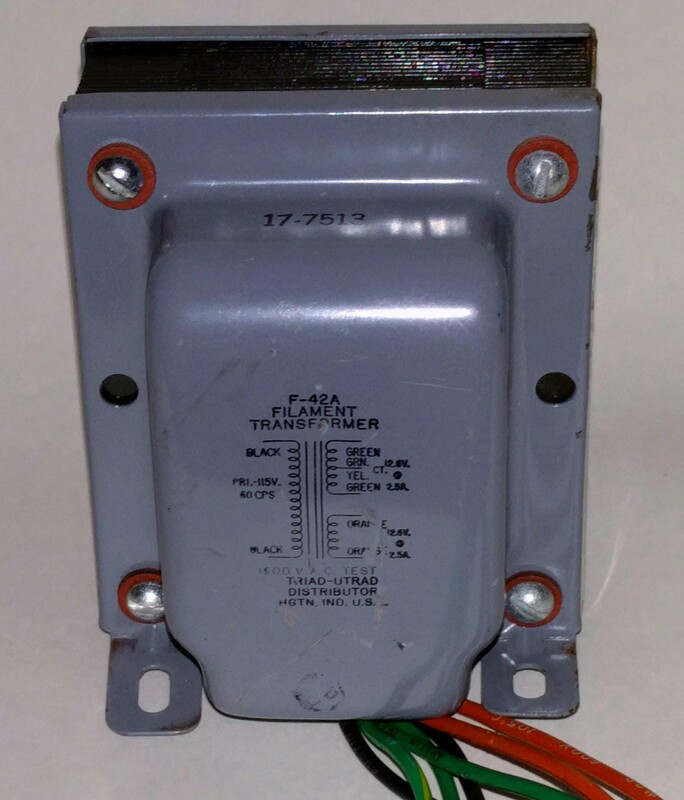 Shifting the voltage down is the reason a -130V supply is needed. 6 (The two inverters form a Schmitt trigger9 due to the connected cathodes and 3K resistor.) The output from this circuit is connected to a cathode follower (described earlier but not shown in the schematic above), which buffers the signal for use by other modules. The diagram below illustrates how the debouncer functions. The red line shows the input, say from a button press. Notice that the switch opens and closes twice before closing for good. If the computer used this input as a control, it might perform the operation three times. The blue line shows the debounced signal, which turns on once cleanly. To perform the debouncing, the debouncer uses a resistor-capacitor filter to smooth out (i.e. integrate) the input signal into a slowly-changing signal; this is the green line. When the green signal gets high enough; the output turns on. Note that the output stays on even though the green signal drops in the last bounce. This is due to the Schmitt trigger; it turns off at a much lower level than where it turns on. 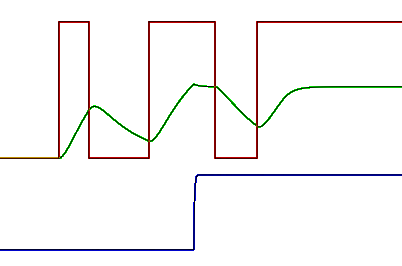 Signals in the debouncer: red is the input (with bounce). Blue is the debounced output. Green is the internal signal after R-C filtering. This image is from an LTspice simulation of the module. The tube module contains five debounce circuits, each made up of a trigger and a cathode follower. The diagram above shows how these circuits map onto the eight tubes. 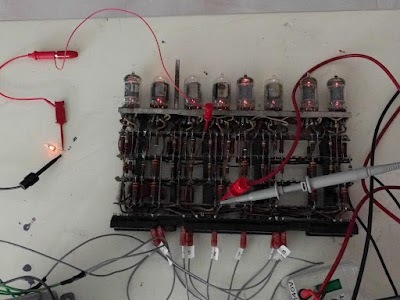 Each cathode follower (CF) uses one triode (half a tube) so there are two cathode followers per tube.11 Since there's one triode left over, the last debouncer (5) has a double cathode follower for a higher current output. 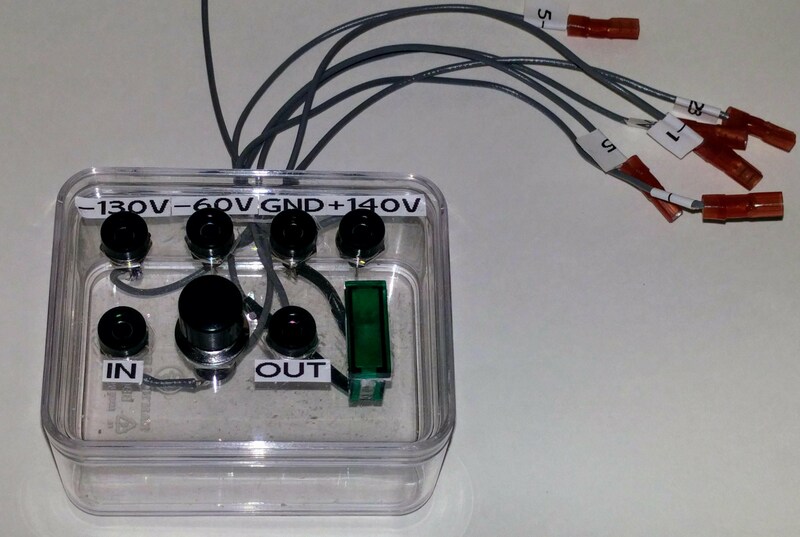 The photo below shows that someone marked the top of the module with red and greed dots indicating the two tube types and functions, probably to simplify maintenance. Top of an IBM tube module type 330567. The red dots indicate 6211 tubes and the green dots indicate 5965 tubes. We tested one of the five debounce circuits in the module. 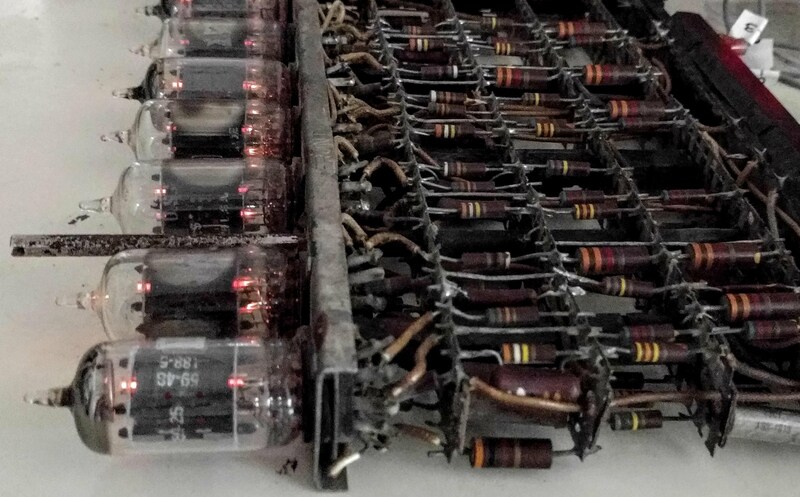 Although the tube module contains five debouncers, some resistors were knocked off the module over the years, so debounce circuit 4 was the only one we could use without repairs. 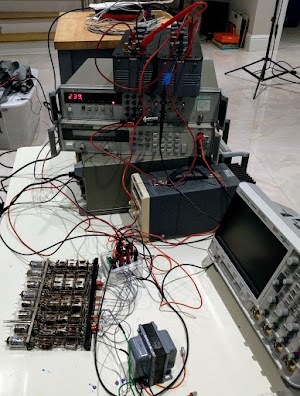 Below, you can see the power and signal wires hooked up to the tube module, along with an oscilloscope probe to view the output. At the left, we have wired a neon bulb to the debouncer's status output. In the computer, these status outputs were connected to neon bulbs on the console or on maintenance panels. The tube module in operation. The filaments illuminate the tubes. At the left, a neon bulb is connected to the module's neon output. 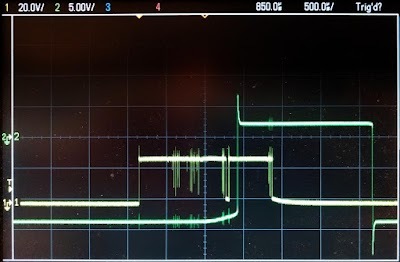 The oscilloscope trace below shows the debounce circuit in operation. The input (yellow) is a pulse with contact bounce. You can see a bunch of large spikes due to bounce, as well as couple bounces of longer duration. There is also some bouncing at the end of the pulse. 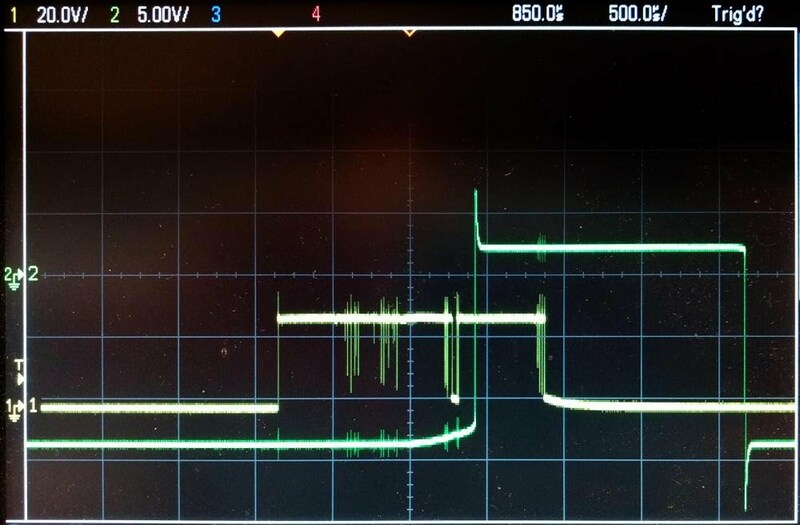 In contrast, the output (green) is a clean signal with a sharp transition. The bounce and noise in input signal could cause erroneous operation if used in a computer, for instance causing multiple operations. On the other hand, the output signal provides a single clean pulse to the computer, ensuring proper operation. Note that the output signal turns on and off about 1.3 ms after the input signal; this delay is due to slow charging and discharging of the R-C filter. The lower trace shows the input with contact bounce as it turns on. In the output from the tube module, contact bounce has been eliminated. Once we had the tube module operational, we hooked it up to a vintage HP pulse counter. Without the debouncer, pressing a button would result in multiple counts; each bounce incremented the count. But with the tube debouncer in the circuit, each button press resulted in a single count, showing the module was functioning. Marc's video below shows the pulse counter in operation. Because the pulse counter could only handle 5 volt inputs, we used a resistor divider to reduce the voltage from the tube module. The resistor divider was implemented with large resistor decade boxes; they are on top of the stack of power supplies in the earlier photo. Despite its age, the tube module still worked. (At least the one of the five debouncers we tested.) I was a little concerned about putting high voltages through such old electronics, but there were no sparks or smoke. Fortunately Marc had enough power supplies to power the module, and even though we fell a few volts short on the -130V and +140V the module still functioned. The module was bulky and consumed a lot of power—I could feel the warmth from it—so it's easy to understand why transistors rapidly made vacuum tube computers obsolete. Even so, its amazing to think that the principles of modern computers were developed using vacuum tubes so long ago. Thanks to Carl Claunch for providing the module. Thanks to Paul Pierce, bitsavers and the Computer History Museum for making IBM 700 documentation available. Vacuum tube systems used many different inconveniently-large voltages. 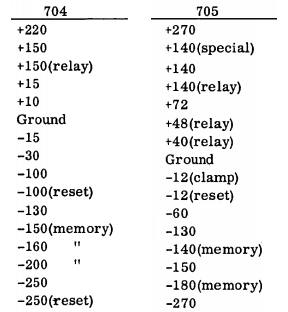 The table below (from 700 Series Component Circuits) lists the voltages used by the IBM 704 (scientific) and IBM 705 (business) computers. 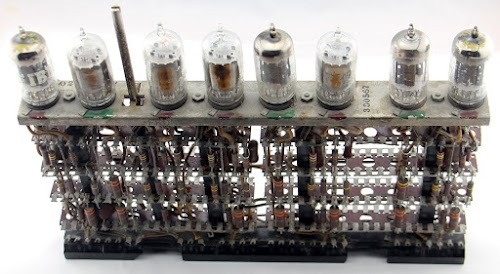 I was surprised that the scientific computers and business computers used totally different voltages, but historically they were entirely different systems. IBM's 701 scientific computer started as the "Defense Calculator" project, while the 702 business computer came from IBM's TPM II (Tape Processing Machine) project. Thus, the two branches of the 700 series ended up with completely different architectures. (Among other differences, the 701 used binary while the 702 used binary-coded decimal characters.) They also ended up with different hardware components. 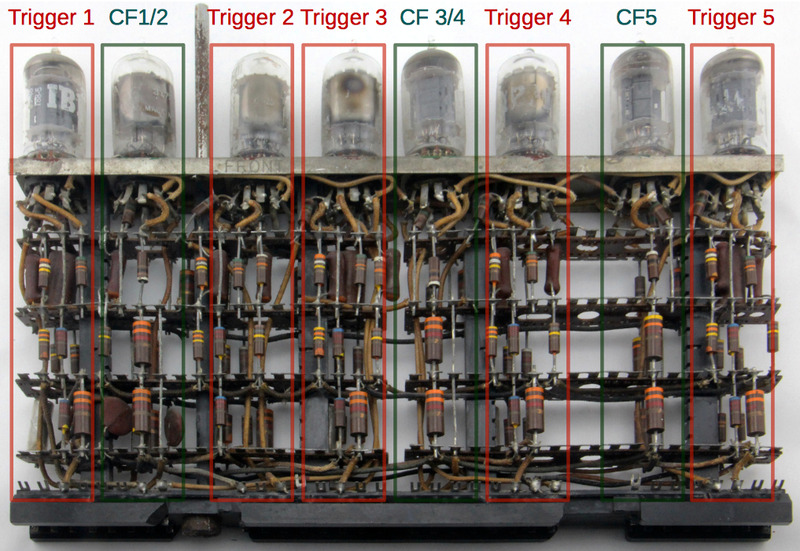 IBM's vacuum tube computers use a large variety of voltages. Based on 700 Series Component Circuits, page E27. How do you have the time for this? Another story that will perpetuate the story and make us think ahead. It is hard to believe that we were able to build these machines because of the need for computing. Congratulations on the excellent article. In the 90s I was actively building vacuum tube stuff, mostly audio, though I did get a regen shortwave receiver working for a while. I bought a bunch of these IBM modules from a surplus place and wound up using the tubes for other things. Never did try to get one working as a module. I wound up selling them to a guy who stripped the parts to repair tube guitar amps: people wanted the crappy carbon resistors and not very good caps for that "vintage tone". The most useful project I built was a bench power supply giving +400, +200, and 0 or +/-200v B+ and 6.3 regulated heater voltage and a -5 to -100 volt bias supply at a few mA. I had a variac feeding an industrial control transformer and a bridge rectifier through a series wired two prong female AC socket I could use a lamp in as a current limiter. No company will make such a supply now because of liability or so they tell me.